You share a file by sending a hyperlink (referred to as a 'Shared Link') to the recipient. 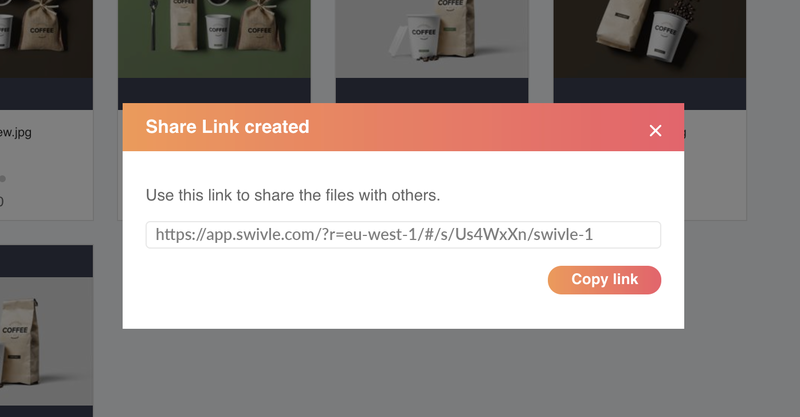 This hyperlink gives that recipient access to only those files in Swivle that you share. Figure: Files when viewing them in a Shared Link. You can share individual files or Collections. The benefit of using Collections is that when updating the Collection (for example by adding or removing files), the Shared Link is also updated. Once the Shared Link has been created, you can at any time update the settings such as the name, description and options. 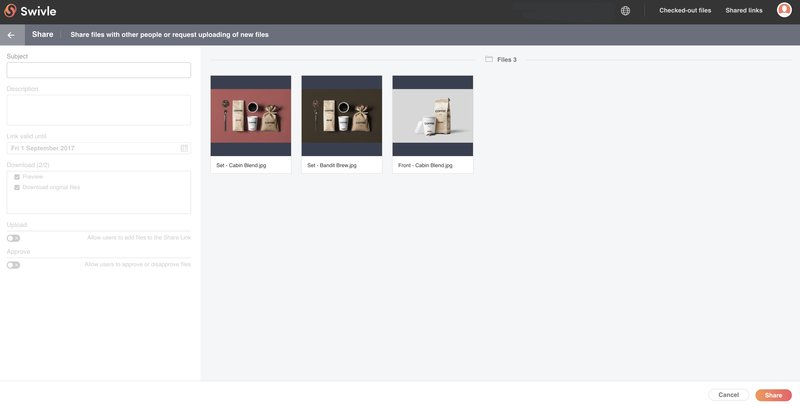 Adding or removing files is only possible by sharing a Collection. Step 1. 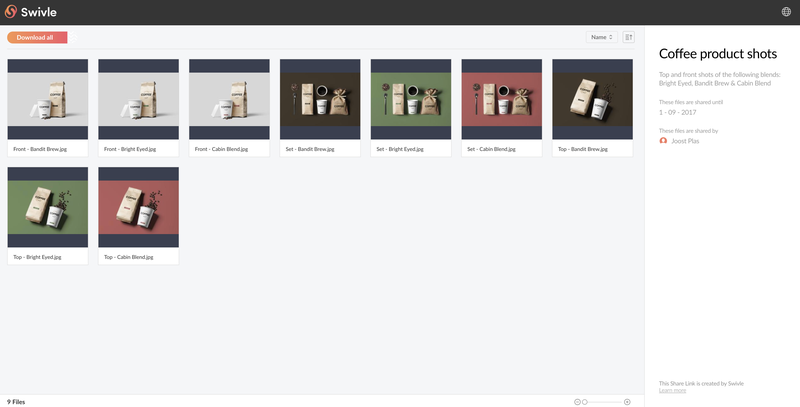 Select the files or Collection that you want to share and click Share in the menu. Right-click the selected files or Collection and choosing Share... from the menu. 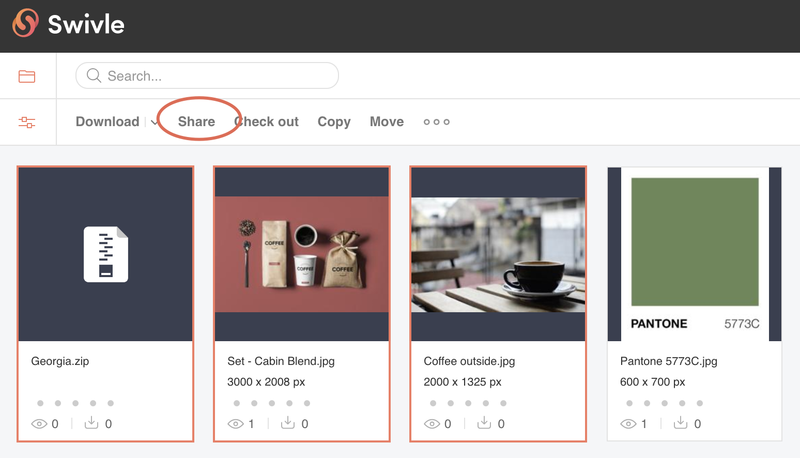 Access the Pinned Collection panel, open the menu for a Collection and choosing Share... from the menu. Upload. (Off by default) Select when you want the user to be able to upload files. You can specify a folder by choosing an existing folder or by creating a new folder. Step 3. In the bottom right corner of the screen, click Share. Step 5. Share the link in some way, for example by including it in an e-mail that you send to all users who you want to see the files. When the link is accessed, a Web page opens showing all files that are shared. Figure: The shared files as the recipients sees them. Once a Shared Link has been created, you can edit the options of the link, view the link or delete the link. To see an overview of all Shared Links, click Shared Links in the top right corner next to your avatar. Figure: Click Shared Links to see an overview of all Shared Links. Tip: To quickly find a Shared Link when many links exist, use the filter on the left.